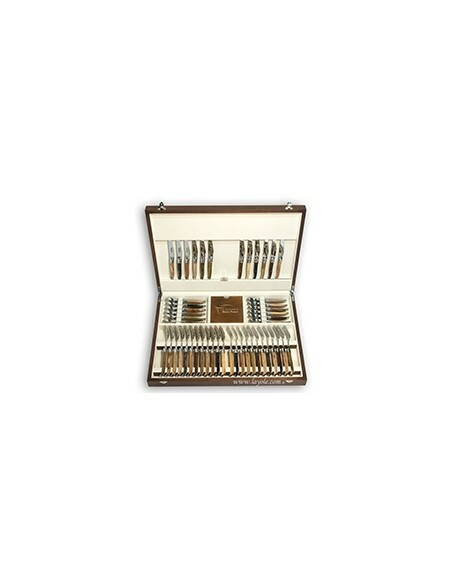 Sets of our Laguiole table cutlery help you to create stylish place settings. 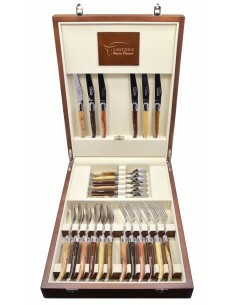 This is especially so with the table cutlery set, which has handles in 12 kinds of wood: each of your guests will have a different species of wood in their hands. 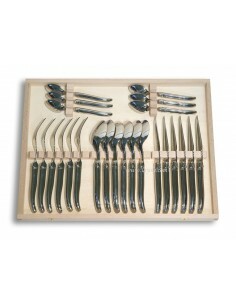 You will also find the pieces to make up the table cutlery sets by ‘family’: table knives, forks and spoons. 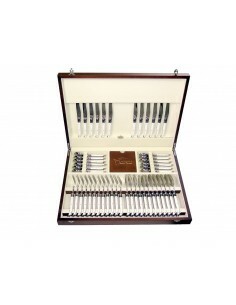 It is possible to build up your set of Laguiole table cutlery gradually over several years (we do not discontinue our products). 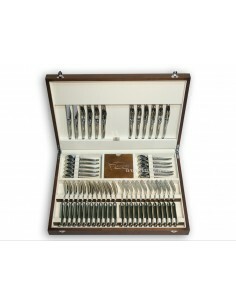 Laguiole table cutlery sets that are dishwasher-safe are available in two types: all-stainless steel or with black POM handles. 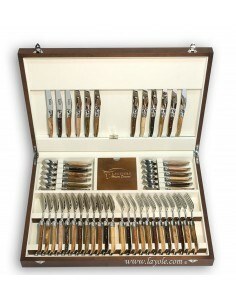 Laguiole table cutlery sets with wooden or bone handles feel natural and are pleasant to hold. On the other hand, these cutlery sets must be cleaned by hand (with a damp sponge, never immersed in water nor held under running water). 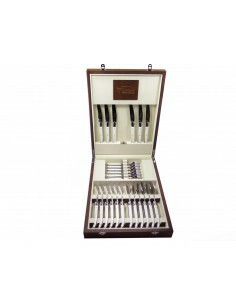 Sets of Laguiole table cutleryThere are 7 products. There are two types of Laguiole table cutlery sets that are dishwasher-safe: all-stainless steel or with black POM handles. 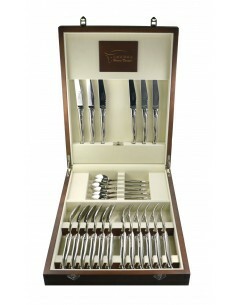 This is especially so with the table cutlery set, which has handles in 12 kinds of wood: each of your guests will have a different species of wood in their hands. 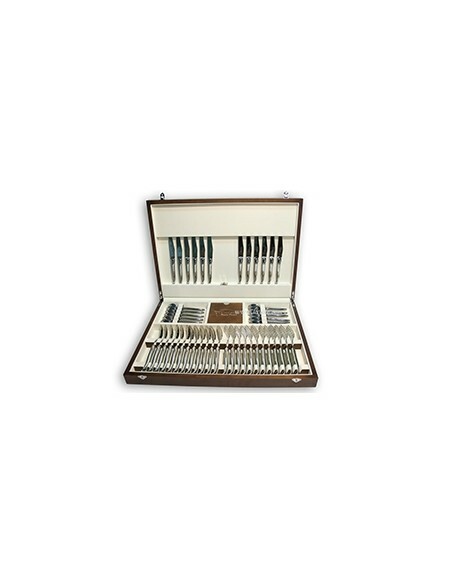 It is possible to build up your set of Laguiole table cutlery gradually over several years (we do not discontinue our products). Garantie lave-vaisselle 50°C La ménagère comprend 6 couteaux, 6 fourchettes, 6 cuillères à soupe et 6 petites cuillères. Les 24 pièces sont en plein manche tout inox (il n'y a pas de mitres) avec abeille soudée. Garantie lave-vaisselle 50°C La ménagère comprend 6 couteaux, 6 fourchettes, 6 cuillères à soupe et 6 petites cuillères. Les 24 pièces ont un manche corian avec mitres inox brillant et abeille soudée.